Today was Jolin's first concert in the USA as part of her PLAY World Tour (it was at 1:00 AM US Time)! Thank you everyone for following!!!! 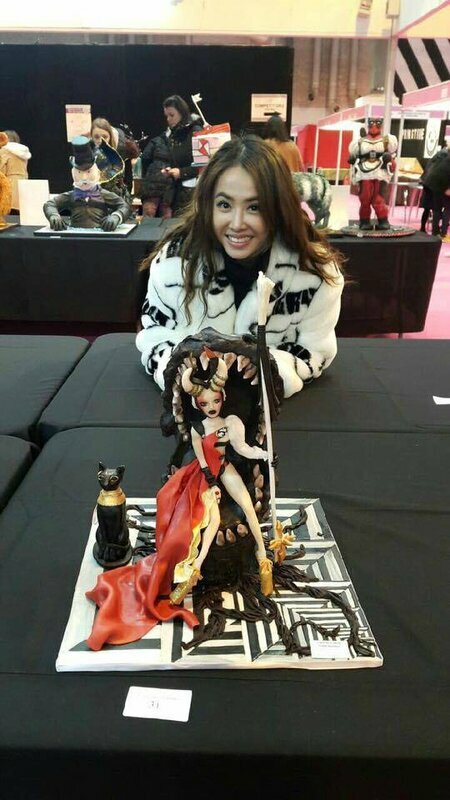 Comments on PLAY World Tour, Atlantic City (March 26th): setlist, pictures, fancams + Jolin Jeneration's 200,000 visits!!! I've been to the show and I must say it was a unique experience! The Borgata Event Center is a hall with 2,000 seats. I'm not good with numbers, but I would assume that there were about 1,500 people there. I would have wished that the event received more promotion, it could have been easily sold out. A pity I haven't seen it being advertised anywhere, not even on her facebook page... In fact, I wouldn't have known she was doing USA concerts if it weren't for your blog! Thank you very much! Well, I will not ranble here, but there are some things that let me slightly disappointed. I do know that to fit a show designed for arenas into a hall is kind of challenging, but I felt that some essential things were left out. First, no medusa headdress. Second, she didn't came out of a skull when performing I'm not yours (which is understandable since her, the dancers and the band were sharing the same small stage, so not a lot of space to move). Third, less dancers on the stage (no female dancers this time). But what really let me down was that she didn't speak english on the MC. I'm well aware that 95% of the people there were either Chinese or Chinese-speaking people, but come on, she's on USA, so why not try talking a little bit of english? She did noticed that there were some non-Chinese people on the audience (including me, yay! ), and asked us if we speak Chinese. Of course we said we don't, and she responded: "but you sing my music, right?". It was a funny moment, but that's the only english interaction we had all over the show. Ok, but I won't talk only about the downs of the show, or I wouldn't be fair. It surprised me how enthusiastic the audience was, the security staff was having a really hard time to prevent people to come near the stage to wave at her, take pics and touch her hands lol. She even said "I love crazy fans!". Some fans were wearing a personalized t-shirt. I was wearing my fanclub t-shirt, of course! But I think nobody noticed lol, I had a cardigan on covering most of it. My comment turned out too long, sorry for this! Oh, just a correction on the setlist: unfortunately she didn't sing Nothing Left to Say this time. That's it! Keep up bringing us the latest news about Jolin! Thank you for your dedicated work! What you're saying reminds me a lot of the feedback I got for her Myself World Tour concert in London back in 2012. She left out some stuff, a few songs from the setlist as well, and only spoke in Chinese during talks. I also saw some tweets from London fans on that day saying that they didn't even know that she was having a concert in the UK... They were of course disappointed. Actually her concerts outside of Asia are unfortunately targeting people of Chinese descent living in those areas/Chinese people studying overseas... So basically they're not expecting non-Chinese speaking people to come to her concerts at all. Marketing is mostly done as a consequence in Chinese by the organizer's Weibo and by fanclubs.